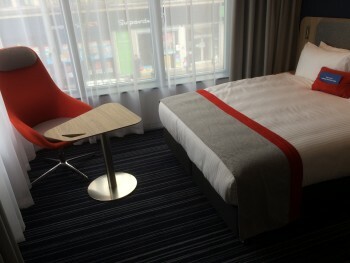 This is my review of the Holiday Inn Express London Ealing hotel. Last week had a wild and crazy travel schedule even by HFP standards. As well as visiting Southend on Monday, I headed out to West Ealing on Friday. 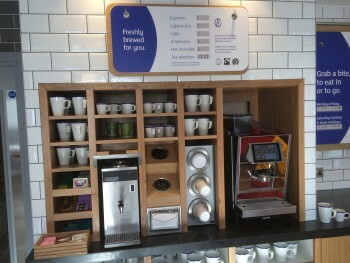 The reason for my visit was to take a look at the new Holiday Inn Express London Ealing. 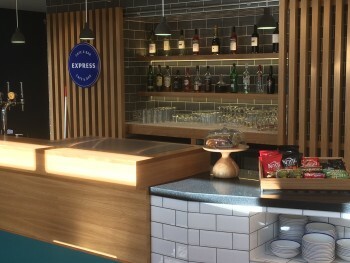 This is the first Holiday Inn Express in the UK to feature a new ‘next generation’ design which will be the template for all new properties going forward. I have to say I was impressed. 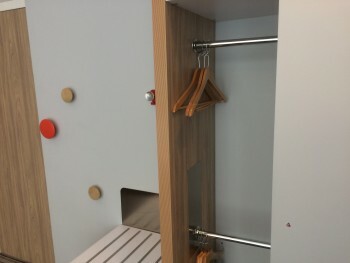 The first wave of Holiday Inn Express hotels was developed around a ‘cheap and not hugely cheerful’ prefabricated room template. There was nothing wrong with the quality but it was pretty dispiriting. 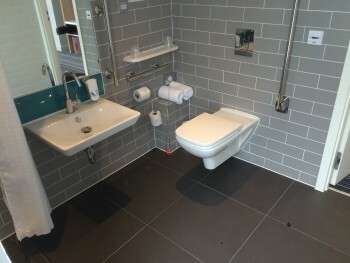 If you’ve ever stayed in one, you will have marvelled how the bathroom door also doubles as the toilet door. 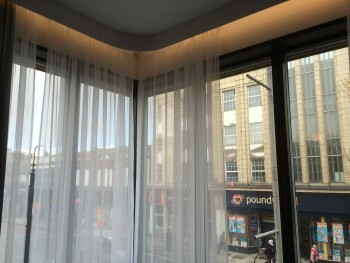 The problem is that chains like Premier Inn, which are pitched at the same market, chose to invest in a more upmarket design and HIX was getting left behind. This ‘new generation’ of design is meant to reverse that trend. The room is bright with neutral colour scheme, offset by red accents in the Bodum kettle, chair, document rack and cushion. I liked it. The TV is a Smart TV. This is the first time that I have seen one in a hotel as far as I can remember. You can call up BBC iPlayer, YouTube etc. It swings back from the wall to face the bed. You still get a kettle, tea, coffee etc. There is no desk. 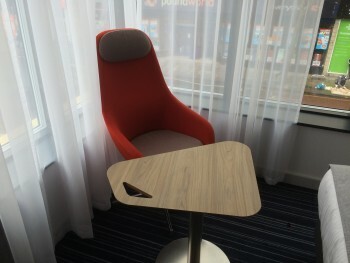 You get a funky but not hugely comfy chair and the wooden table. At least it is a wooden table and so can be used with a mouse, unlike the glass table I had at The May Fair Hotel last week. Unfortunately, they messed up here. There is no plug socket anywhere near the desk so unless you have a 10 foot power cable you will be doing some furniture rearranging if you want to work. Speaking of power cables, the hotel has powered USB sockets as well as traditional plugs. Here is a nice touch. What you have below is a mirror which, instead of being fixed flat to the wall, pivots out at 30 degrees. 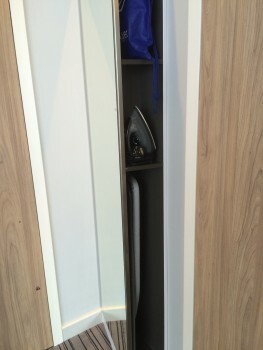 This creates a void where an ironing board and iron can sit. I then opened the bathroom door and was genuinely surprised. I would be perfectly happy to spend a few days in a hotel like this. It reminded me of the Hampton by Hilton in Berlin where I had a great stay around five years ago and when I first realised that Holiday Inn Express was going to be in serious trouble if it didn’t modernise. But what about the hotel itself? I should add a few words about the hotel itself rather than just the ‘next generation’ design. Holiday Inn Express London Ealing is not the best located hotel in the world. It is well over a mile from Ealing Broadway underground station. A far better option is West Ealing mainline station, about 6-7 minutes walk away, but that has only four trains an hour and is closed on Sunday. West Ealing trains connect to the tube at Ealing Broadway or you can travel into Paddington. Sitting directly on Broadway, you are not short of shopping options – although mainly of the Poundworld variety. I can imagine that it could also get noisy at night in the rooms overlooking the street. 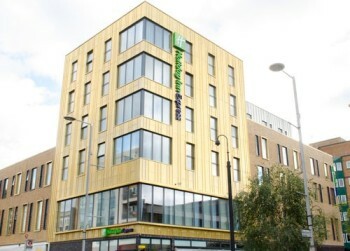 This is all reflected in the price – one of the cheapest Holiday Inn Express properties in London. Given the high quality and general all-round ‘newness’ of the hotel (with free breakfast for everyone) I would recommend it as a decent option if your budget is low but your standards high. You can find out more and book on the hotel page of the IHG website here. 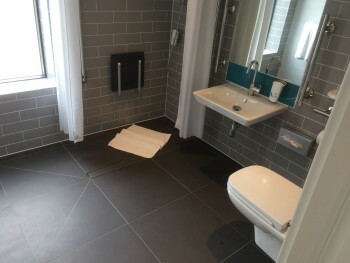 The refurbishments of HIX from the old brown themed rooms to the blue themed rooms have been ongoing for a number of years. This looks like a minor variation on that theme, or is it just some artistic flair from that particular hotel owner! 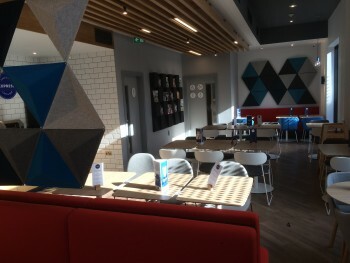 I think the blue rooms are functional but effective (HIX T5) though the breakfast arrangements at some can be chaotic at busy periods (HIX Dunstable). This is, officially, the first hotel with this design model so I expect others to be very similar going forward. You reminded me of a stay in a south coast Travelodge where the TV was fixed to the bracket by some kind of industrial bicycle chain/lock. For me, the biggest requirement of the television is an HDMI socket, so I can plug my laptop in and play Amazon Prime/Now TV etc through it. There are still hotels with old CRT style tellies which have no inputs, or flat screen with no HDMI in. 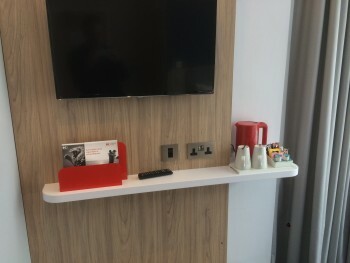 Must say I was very impressed at a recent Hyatt Place stay in California – nice big HDTV with a full breakout set of connectors on the side of the unit below it – VGA, composite, HDMI, the works! Very nice. Decent breakfast spread included too – can see why HIX are upping their game. Have got a HIX San Francisco stay from tomorrow – booked on the 20k/night rate mentioned earlier this year which was a total steal 🙂 Will be interested to see how it is, US HIXs generally been better than UK ones from my previous experience. If you are staying there i’d thoroughly recommend a trip to Persian Palace for some outrageous portions of kebab and rice. Not sure whether you think this is a kind or an unkind review. In the context of what? 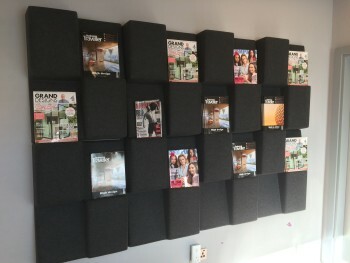 This is not a hotel review per se, more a design review, and the photos tell the story. Not funded by IHG in any way! OT: Curve card – ‘Make sure first purchase is Chip & PIN’ When does the PIN arrive? Have I set it on the App at some point? I really can’t remember as it was so long ago when I applied for the card. when you activate the card in the app the PIN is displayed. yip, the app will give you the pin. When you first set up the card in the app, there is a screen which pops up with your pin. You have to re-enter it to make sure you remembered it. If you’ve forgotten you may need toe ring them up. Cheers. I probably know what I entered. I’ll give it a go in the morning. “Free breakfast for everyone”… Didn’t IHG get in to trouble for describing the breakfast as free?! I thought it was technically an included breakfast. Anyway, it looks great (the room, not the breakfast). I really like holiday inn express hotels, I don’t even mind the quirky bathroom/toilet door. The new design looks even better. Happy. Yes they did. Legally they cannot call the breakfast free because no-one is charged for it. One of the more bizarre ASA verdicts! I have to say the ‘wet room’ looks superb for what it’s worth. Wet room, Waitrose, 4 trains per hour and Persian Palace nearby. What more does one want?